Relita-Kazan Hotel is located just 5 minutes drive from Kazan's historic centre with the Kremlin and Qol Sharif Mosque. Guests are offered air-conditioned rooms and a restaurant serving Tatar cuisine. All the clean rooms are fitted with a flat-screen TV. Bathrooms come with a shower. Tatar cuisine, as well as Russian dishes, are served in the on-site restaurant. A shopping centre is 1-minute walk away. Kazan Arena is 4 km away and Riviera Water Park is 1.5 km from the hotel. Kazan Train Station is 4.5 km from Relita-Kazan Hotel, and you can get to Kazan Airport in 35 minutes by car. 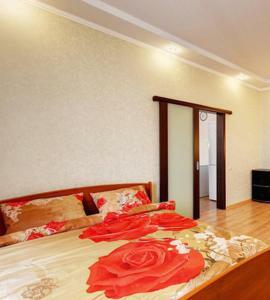 When would you like to stay at Relita-Kazan Hotel ? Air-conditioned room with a flat-screen TV and a minibar. The private bathroom comes with a shower, hairdryer and free toiletries. Air-conditioned room with a flat-screen TV. The room features the view of the bay. Air-conditioned suite with a flat-screen TV. This suite features a living room. This apartment features an electric kettle, an oven and a kitchen. This twin room has air conditioning, a cable TV and a minibar. Guests of 13 years old and younger are not allowed in the hotel's fitness centre. Guests of 14-18 years old can only visit when accompanied by parents or legal guardians. Please note that children 10 years and younger stay at the property free of charge while using existing beds, breakfast not included. Children should be accompanied by parents or legal guardians. Each day we'll check prices and send you an email for your selected dates at Relita-Kazan Hotel. If you don't have specific dates but would like to check prices for say next weekend or say next month we can check the price too. Click to write a review and share your experience of Relita-Kazan Hotel with other travellers.